Gayl Basson has been drawn to animals since childhood. Her earliest memories are of seeking animals out wherever she went, and preferring to spend time with them rather than humans. After qualifying as a nurse and venturing into real estate, Gayl finally followed her heart and volunteered at a rescue organisation. She also fostered dogs. At the same organisation, she became friends with Shireen Williams and they began to dream of running their own shelter and always having a safe, permanent place to house their foster dogs and rescues. A 'thank you' not only to the individuals who support Fallen Angels, but also to the Companies that make Fallen Angels what it is - you all make everything possible - thank you - and please support them in turn! Gayl and Shireen were adamant that their shelter would be a pet rescue, not an animal rescue, so people would understand that they were responsible for the dogs or cats they adopted; that they were to be loved, protected and cared for. The shelter would also be family-friendly, aimed at changing the perception that such places were depressing. Fallen Angels was going to be an uplifting place to visit with happy, well-looked-after dogs. Undeterred, Gayl bought the land and with the help of her father, a portion was flattened and cleared. 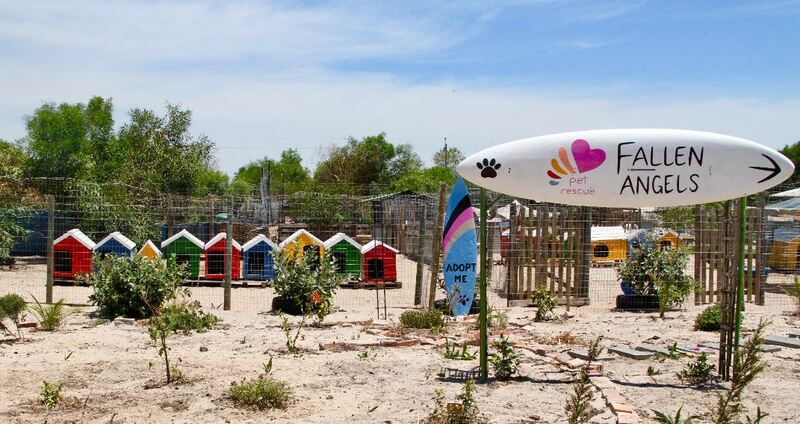 With donated Wendy houses, pallets and containers, a backyard with camps and kennels took shape where the rescues settled in. By the end of 2014, Gayl had also moved in. Gayl and her team are trained in the aspects of dog behaviour required for shelters, having most recently studied with canine behaviouralist Scotty Valadao of Friends of the Dog. They are pioneering a new approach in the rescue industry by offering basic behaviour advice and training to owners before they take their new family member home, as well as facilitating the introduction of existing dogs to the new addition, ensuring they get on well. To this end, Friends of the Dog and several sponsors raised funds to build a separate introduction area where these ‘meet and greets’ can take place on neutral territory (not in the existing dogs’ homes) and without distractions from the main shelter. Fallen Angels also stays in touch with owners via email for up to three months after adoption to assist with queries, information and problems. “This helps hugely to prevent dogs being returned,” says Gayl, and as a result, Fallen Angels’ adoption success rate is high. With around a million dogs and cats being euthanised in South Africa every year, Fallen Angels’ main focus is on sterilisation to prevent more unwanted animals being born. They have a target of sterilising 50 animals a month, which also ends the cycle of seasonal births. Their secondary aim is to educate schoolchildren whether in the city, the townships or in rural areas. “We believe strongly that the biggest change can be brought about by teaching kids that animals are sentient beings who look to us humans for their welfare,” Gayl stresses. Fallen Angels also invites children to the shelter and they arrive in busloads to interact with the dogs and learn about their care. Fallen Angels works with several organisations that focus on animal welfare in the townships, such as the SA Mass Animal Sterilisation Trust, a clinic in Khayelitsha where animals are also often surrendered, and the Mitchells Plain Animal Welfare that Fallen Angels helped a resident to set up. “Many organisations don’t have their own shelters so they bring animals to us,”Gayl explains. Then there are the Fallen Angels adoption days at shopping centres and other select venues, which have been going since 2014 and are well-known. “We set up enclosures, lay down fake grass, and have some of our adorable puppies available to view and interact with under the watchful eye of our volunteers.” Shoppers can offer to donate or adopt but Fallen Angels doesn’t allow any puppies to be homed on the day, as they have a strict adoption procedure to follow. It includes a home check and assessment of the family’s lifestyle, work hours and so on. Fallen Angels Pet Rescue is a registered NPO (NPO 175-638) focusing on the rescue, rehabilitation and rehoming of domestic animals. Network for Animals, Bidvest Van Rental, Pinpoint Tracking, My Cover Plus, Sonic, Century 21, Dancers Love Dogs, Vondis, Absolute Pets, Instant Tags, Animal Rescue Rehab Organisation (ARRO), Doggobone, RE/MAX and Freshstop.